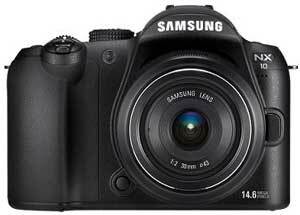 is the latest digital camera to be launched that is neither a digital compact camera or a digital SLR camera. It’s no new single category as such, but in one guise or another these hybrid cameras have hit the market, with models from Panasonic, Olympus and Ricoh already released, and Sony have announced one to come. They vary in their approach, but in common they seek to combine the ease of point and shoot cameras with the flexibility and creative power of digital SLRs and their interchangeable lenses. Eschewing the need for the mirror system, these new hybrid cameras are only about two-thirds of the size of a digital SLR. Interchangeable lenses on offer initially will be Pancake, Standard Zoom and Tele Zoom, with an additional five lenses for the system to appear later in 2010. The 3-inch viewscreen used in Samsung’s NX-10 uses its AMOLED (active matrix organic light-emitting diode) technology, previously used in Samsung’s mobile phones. AMOLED screens provide excellent viewability, even in difficult conditions such as use in sunlight, or when viewed from acute angles. The camera’s smarts kick in with the screen – as you put the camera near your face to take a shot, the screen dims to conserve battery life. In addition to taking still photos, the NX-10 shoots HD video (720p, not the ‘Full HD’ 1080p), using the H.264 codec. 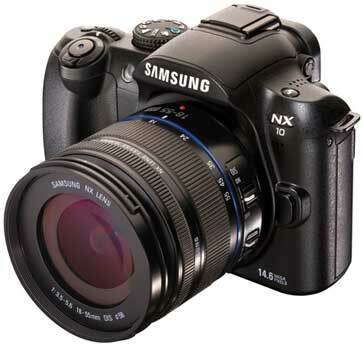 Buy the Samsung NX-10 with the 30 mm pancake lens and the RRP is $899, with the 18-55mm lens, the RRP is $849. The camera will be available in Australia in April. Keep up with TechStyle’s articles, news, reviews and more, by having it delivered direct to your email inbox. Subscription is quick, easy, and you control your subscription.